Need more information about booking Home 9039081 ? Nestled amongst the tree tops in a quiet, secluded part of Venus Bay, The Magic Beach Cottage is a lovely 2-bedroom house within walking distance of nearby beaches. The house is named after a children's book written by a Venus Bay local! Just a 20 minute drive from Inverloch and a 30 minute drive from Leongatha, the house backs onto the dunes of the beautiful Cape Liptrap Coastal Park and the long stretches of beach in Venus Bay. The Doyles Road (Anderson Inlet) beach is just a few minutes drive away, and is a safer swimming option for children. It also offers a designated dog off leash area all year round. 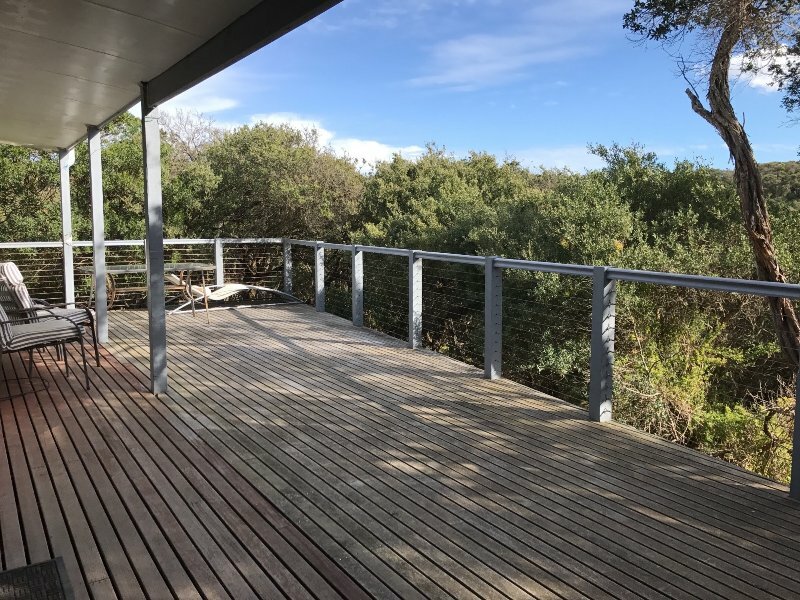 The house features an open plan living/kitchen/dining area that looks out onto the spacious deck and the tree tops of Cape Liptrap Coastal park. It offers a fully equipped kitchen with stove, oven, a full-sized fridge and even a coffee maker. At night or for those times you'd like to stay in, there is a 107cm satellite TV, a Blu Ray player, books and board games to keep you and your family thoroughly entertained. You can relax in the sunshine on the large open deck overlooking the tree tops, or cook up a BBQ in the covered outdoor area. The 2 bedrooms can comfortably sleep 6 people. Bedroom 1 sleeps 2, has a double bed and looks out onto the deck and spectacular tree tops. Bedroom 2 sleeps 4, has a double bed and bunk bed suitable for children. Bed linen is provided for your convenience. The house features reverse cycle air-conditioning, a wood combustion heater for those chilly nights, fans and double glazed windows to keep the temperature as desired. And if you'd like to do some laundry a washing machine is also available. "The beach house had everything you could possibly need. A tv to watch outside, an outdoor heater on the deck and an amazing seating area on the decks to sit and relax. The kids also loved it with lots of room in the living areas for them to play." "Be careful with the atmosphere, it will take you by surprise. Everything was there that you would need to never leave." “Would definitely recommend!!! Noisy wombat. Lovely home"
A car is recommended to get around from the house to the nearby estate where the shops are. However, if you are just going to the beach, walking or biking is ideal. You will have full use of the house and the grounds. You will be promptly contacted via email by the owner regarding payment, key collection and other information regarding the property and surrounds. We are also happy to assist during office hours throughout your stay should you have any questions about the property, the facilities, etc. Just give us a call! Check in is at 2pm and check out is 11am. Instructions will be provided when full payment is received. You can get in touch with Jen (the owner) through the contact form on this page. Send Jen (the owner) an email through the contact form on this page. Alternatively, if there’s a phone number on this page, you can call them. How do I contact Jen (the owner)? If you’ve already booked, go to Manage your holiday booking to view Jen the owner's contact details or send them a message. Or send Jen (the owner) an enquiry through the Contact the owner/manager form if you’d like a quote or more info first. When you pay online through the Book your stay form, a booking request is sent to Jen (the owner). You’ll find out within 24 hours whether they’ve accepted - no money will leave your account before then. You can also request a quote from Jen (the owner) through the contact form. The owner will email you the total cost for your dates and a link to book and pay online. Use the Book your stay form to pay provisionally online. You can pay by credit/debit card or PayPal. Jen (the owner) will have 24 hours to accept the booking and no money will leave your account before then. Why can't I call Jen (the owner) before booking? You’ll need to contact Jen (the owner) to do this. Send them a message in Manage your holiday booking or through the contact form on this page. You can request to change the dates or number of people on your booking via the Manage your holiday booking page. To change your holiday dates use the Edit booking button. If you need to change the number of guests staying then send Jen (the owner) a message. If Jen (the owner) agrees, they’ll send you a revised quote outlining the changes. You can review and accept/decline this from the Manage your holiday booking page. You’ll have 48 hours to take action before the revised quote expires.